I've been meaning to put this topic up for a while. 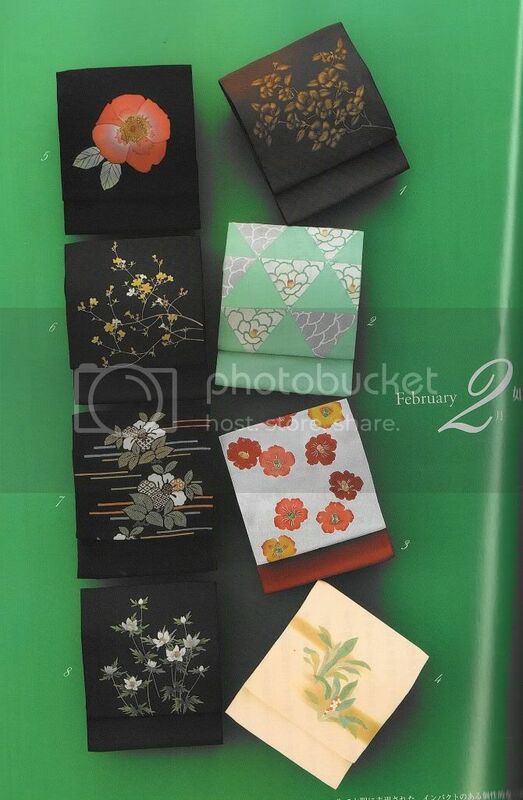 I want to make a definitive reference on what the different patterns on kimono and kanzashi are for each month, since a lot of posts I see are "Help! Is this seasonally correct?!" or things of that nature. I would LOVE any help on this! Please, comment, add ideas! I know very little. 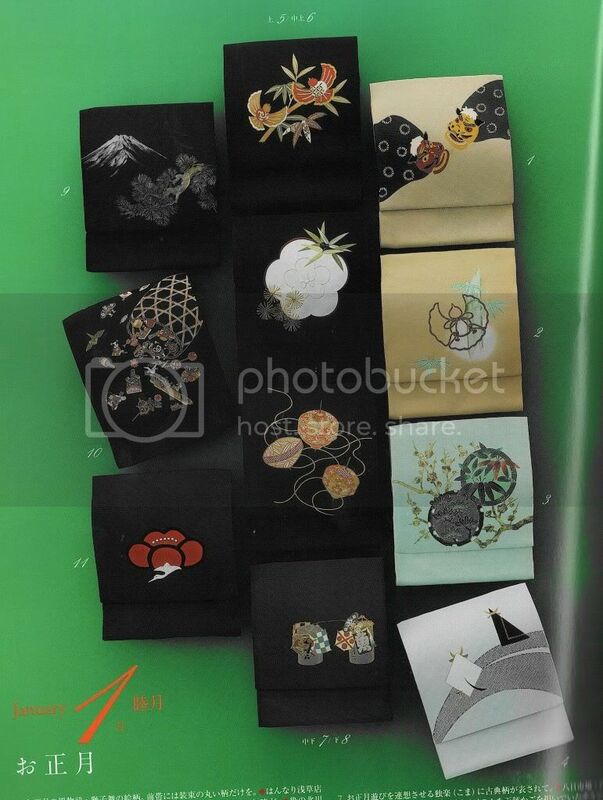 Also, please tell me if it is KIMONO, KANZASHI or BOTH! I can't tell if you just say "April is cherry blossoms", for example. [Update] Okay! Here's a beta-list. I still REALLY REALLY need your help, guys! Huge thanks to GoldenPhoenix. It isn't necessarily entirely applicable, but so far it seems to correspond with the themes listed here, and I've seen a lot of references to poetry and clothing seasonality that seem to imply they go together. 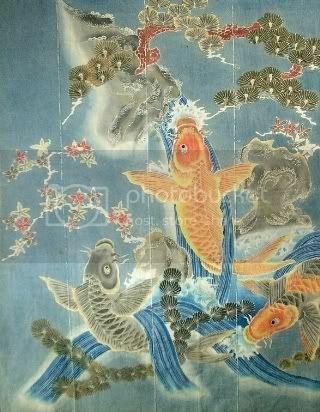 (Choosing combinations for kosode/kimono based on famous poems all the sophisticates would be expected to "get" the references to.) At the very least, it's a heap of concepts + japanese terms to work with. 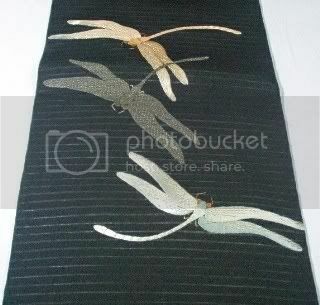 I have evidence of another type of kanzashi motif: omodaka, or water plantain. 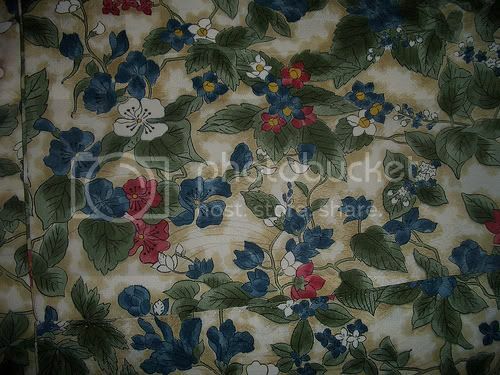 Ã‚Â I will have to check my postcard/photograph when I get home, but I believe it's a June motif. 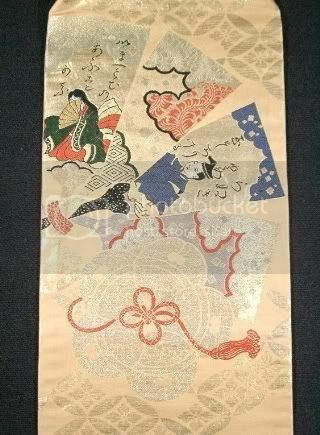 Ã‚Â I also have a postcard of a Pontocho geiko with omodaka motifs on her kimono, obi and uchiwa. Maybe omodaka is a July motif instead? 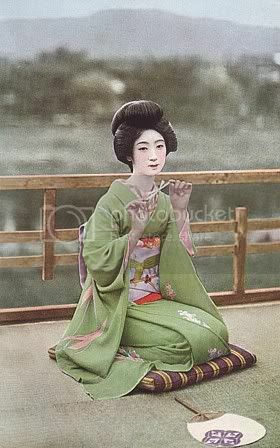 Her obi-age has a dew-on-grass motif on it. It's a little hard to tell with this one, but I think she's wearing an omodaka kanzashi. I'll have to dig up the big scan to make sure. Does anyome recognize the plant type on her kimono? It looks like some sort of water weed. 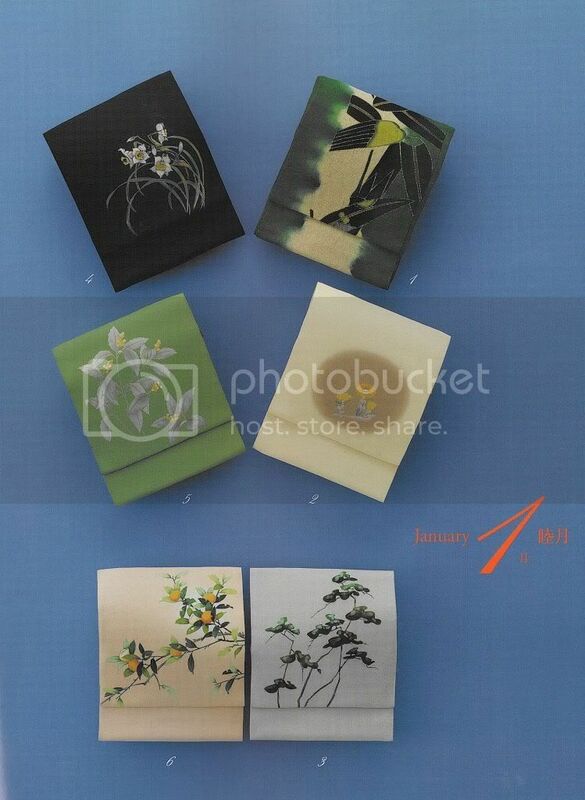 I found another kanzashi type going through my postcards here: katabami, aka wood sorrel. 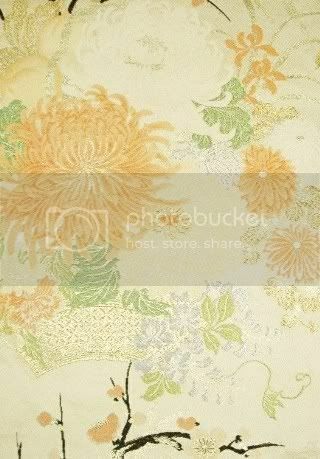 Desu wrote: Maybe omodaka is a July motif instead? 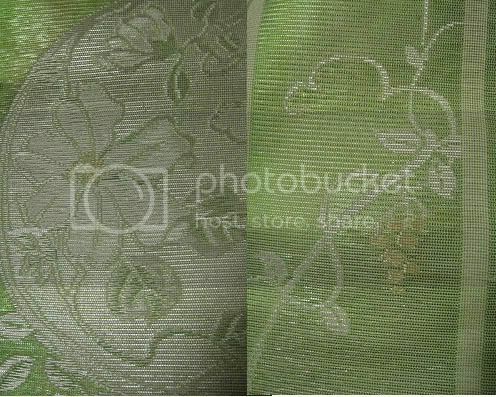 Ã‚Â Her obi-age has a dew-on-grass motif on it. 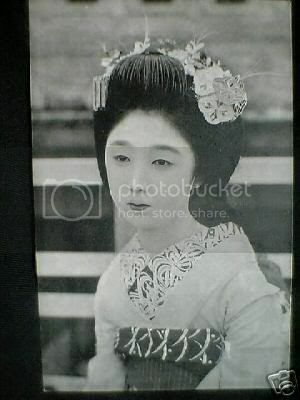 It's a little hard to tell with this one, but I think she's wearing an omodaka kanzashi. Ã‚Â I'll have to dig up the big scan to make sure. Ã‚Â Does anyome recognize the plant type on her kimono? Ã‚Â It looks like some sort of water weed. Wood sorrels! We get those around my house all the time. :D I put omodaka in both Spring and Summer sections with a (???). Do you know where wood sorrel goes? Thanks so much, Desu! This is wonderful!!! Common wood sorrel is a plant from the genus Oxalis, common in most of Europe and parts of Asia. It flowers for a few months during the spring, with small white flowers with pink streaks. 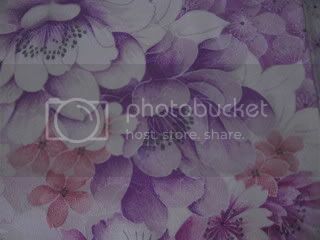 Red or violet flowers also occur rarely. 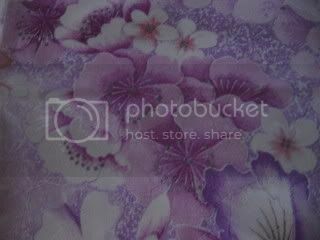 The binomial name is Oxalis acetosella, because of its sour taste. 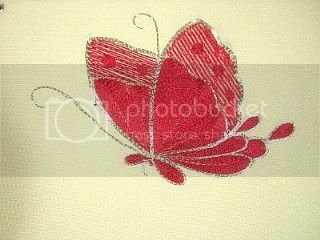 The leaflets are made up by three heart-shaped leaves, folded through the middle. The stalk is red/brown, and during the night or when it rains both flowers and leaves contract. Historically, people have extracted calcium oxalate, or "sal acetosella" from the plant, through boiling. It is slightly toxic, as oxalic acid is known to interfere with food digestion. Another common wood sorrel is Oxalis montana, a North American species found from New England and Nova Scotia to Wisconsin and Manitoba. It is similar to the species described above, but the petals are noticeably notched. The common wood sorrel is sometimes referred to as a shamrock (due to its three-leaf clover-like motif) and given as as gift on St. Patrick's Day. Like clovers, it probably grows in areas with low grasses; meadows, fields, roadsides and maybe even ground cover in woodlands. There is probably also a lot of variation in flower colour between the many different species of sorrels. 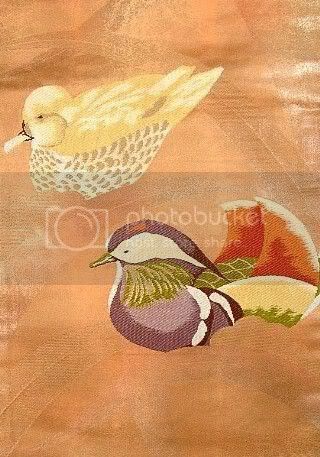 Kikkou-mouyou (tortiseshell pattern) is aupicious, so I don't think it has a season. Geometrics usually don't, and IIRC, kikkou-mouyou means 'long life'. I enjoy them as a beginning to look-sees into the living culture. 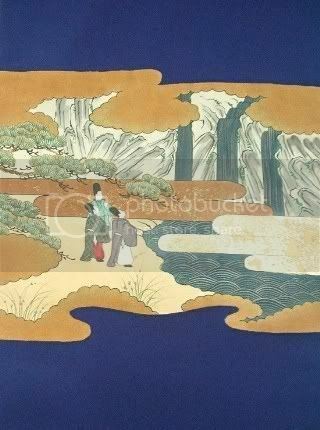 A very good guidebook, "A Japanese Touch for All Seasons" lists great motifs seasonally with seasonal dates, suggestions on the lunar calendar observations. I've only been researching floral and seasonal motifs according to certain matsuri and the lunar calendar...the seasonal motifs might be interesting because it adds 'texture/feel' to the wearing of what works for a design..
for instance, in Tanabata, the great heat gives thirst, so the softness and fluid colors of water suggests coolness...yet there is celebration of wishes, love, the Milky Way and thanks for skill in weaving/sewing; at the turn of after high summer, the thoughts turn to autumn grasses and the yearning for persimmon... and the reverend ancestors are also visited...so perhaps checking through lunar calendar and matsuri festival references will assist on listing the motifs. 1. First thing that might help is the Season, Color, and Pattern Resources thread. It's full of links to the things folks here have been able to find. 3. Some flowers get dangles, some don't, and the flowers themselves are month-specific. 4. If the fan has recognizable motifs on it, and the motifs are seasonal, then the fan itself is seasonal. 5. 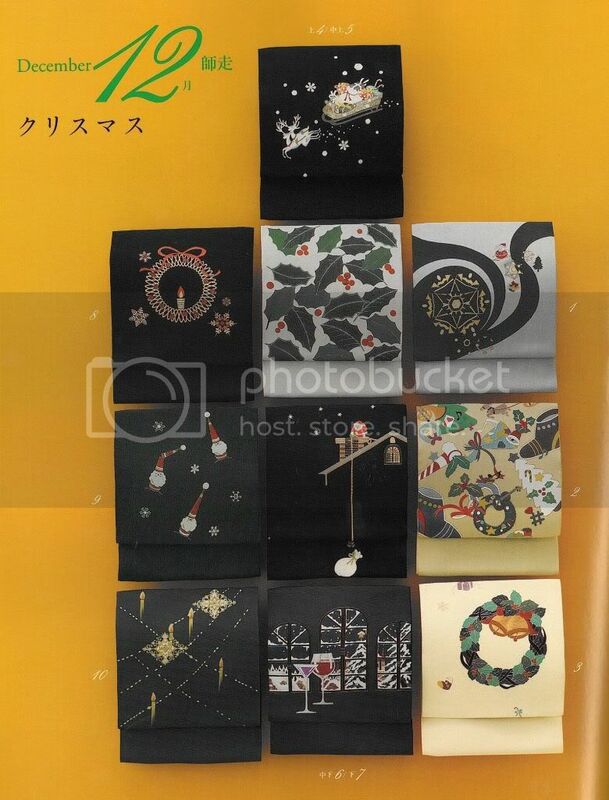 You can buy stretch tabi without kohaze (clasps). However, they aren't that much lighter in weight. And, strictly speaking, they're not appropriate with geta at all. KAKI (PERSIMMON) - the fruit! So few! Any more ideas people? Oh well I guess I can include New Year here too... Most new year themes (except maybe the games) are also for good luck and fortune, so I think they can be worn too at most celebrations! That's about it for now! I've bound to have missed some... why don't the rest of you contribute? I hope this is of some help... and it kept me busy for a happy while! Kohaku-chan, thanks for the great pictoral seasonal pattern guide! It's been a great help to me! However, I have a quick question. 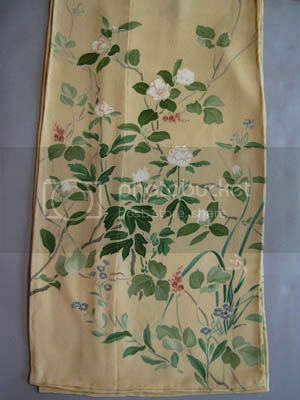 "Asanoha (hemp leaf)" is one of the most popular Japanese traditional patterns. 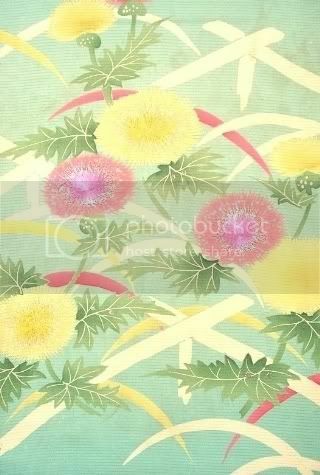 This pattern was named Asanoha because the shape literally looks like a hemp leaf. 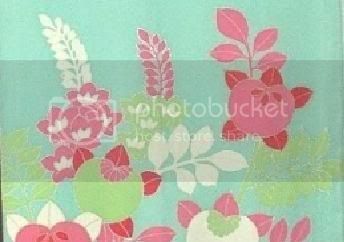 In spite of its name, however, the pattern did not borrow motif from a plant. It is a geometric design with six diamond-shaped patterns arranged in a radial manner. Identifying the hemp which grows well with the growth of a baby, the pattern has been often used for swaddling clothes." 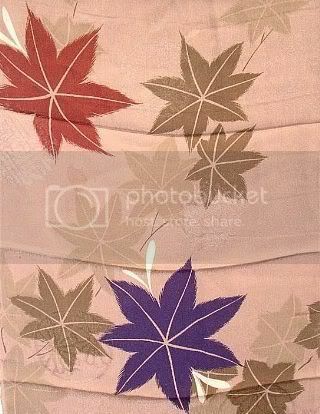 would I get away with having that kimono with the blue maple leaves on in early September? It's lined, but I'm going to wear it in the UK and they are not famous for their warmth so I expect cold weather and rain..
Also, white maple leaves on an mustard/burnt orange/aubergine purple background is too much autumn for september? last question. remember reading some where that the obi can be a little before season right? Like to anticipate whats coming. Am I totally wrong on this? You're definitely right that you can choose to anticipate the season in your kimono and obi. 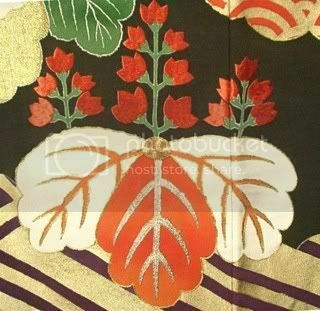 In that case, if a lined kimono is correct for the weather, and the maple leaves aren't literal autumn colors, in my opinion you can wear it in September. Hmm, I feel a little confused. I was looking up paulownia since I just got a kurotomesode featuring large gold and silver paulownia. Somewhere in the posts above, one person mentioned it as autumn but another mentioned it as summer... To add a little more confusion, my tomesode is definetly awase, and very heavy awase at that. 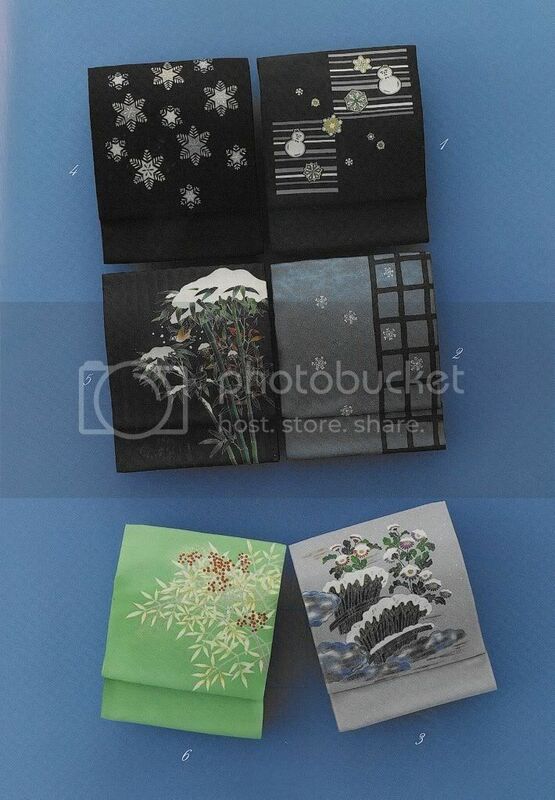 It also says that in the card game hanafuda it represents December - which would make sense with your tomesode. Kiri is prettymuch regarded as being an autumnal motif, despite its actual natural habits I guess, haha. 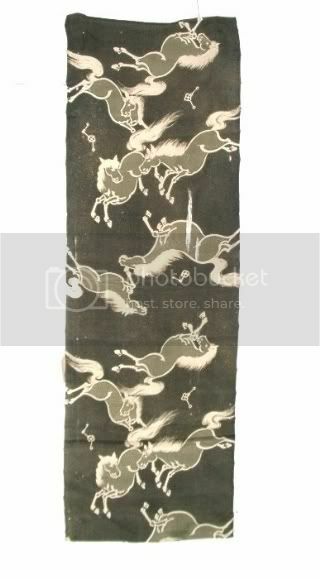 Ayaychika, I would wear your tomesode in fall. You can probably stretch it into early winter, too. Mon are always considered seasonless, because they don't have to do with motif, but rather with family emblems. moonblossom, I think you're prettymuch out of luck. 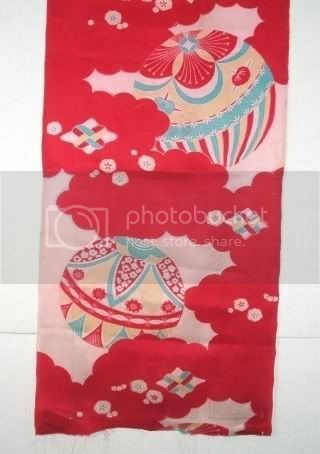 Koi no bori is, without a doubt, a May only motif, just like Hina Matsuri items are March only. (In fact, some really strict oba-chan might say only the week of, and never once it's over.) Motifs having to do with a specific holiday are really small in their wearability scope. Of course, you can gauge the situation and see if you think you can get away with it, but this is the sort of thing where if you run into a Japanese person, they are gonna wonder. It'd be like wearing a jack-o-lantern teeshirt in July. I was searching tachibana citrus and then I end in a web very interesting about plants of japan, by months, bilingual and lots of nice pictures!!!! I managed to find some pictures for you. Yamabuki gave a drawing an an obi! - I suppose there is a specialised way to depict momo in a stylised manner: it would be most like a circle with added petals. I have added a picture below to illustrate. 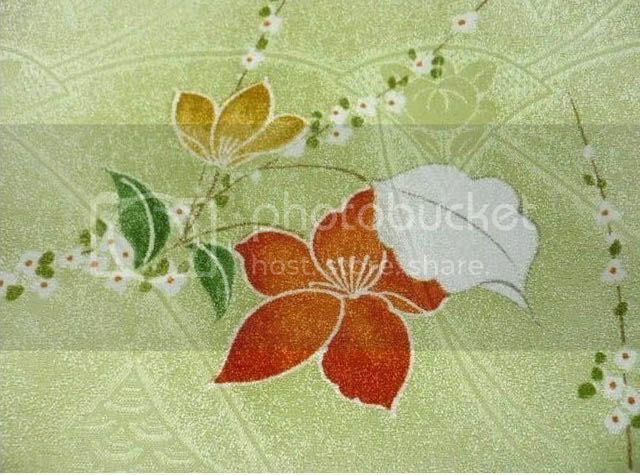 Franciele - It´s all seasons, the obi have momiji, kiku = autumn; tsubaki, matsu, ume = winter. It´s awase too. I also have a request, what kind of flowers are? "It is a faux pas to wear a sakura kimono to a sakura viewing party." Why is this? It just makes a 1000.1% sense to me to wear a Sakura kimono around Sakura trees. I think it would be overdoing it. Maybe you are supposed to let the real sakura steal the show at hanami, and wearing some yourself would be demanding that people admire you as much as the trees, since you wear the same adornments. If my memory is good, one should also wear patterns whose seasonality is a bit in advance. I guess it shows that your sensibility to the seasonal changes is also internal and personal, and not a mere reaction to whatever you see poking out from your window. 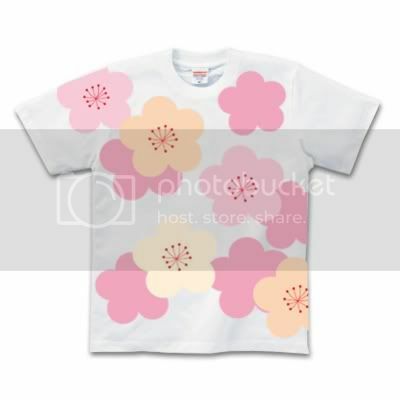 I'd like to add, about wearing sakura to hanami, is that it's just too obvious. It would be like wearing a teeshirt with a lobster on it to a Red Lobster restaurant. 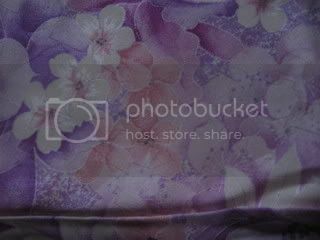 Although, that having been said, and I think everyone and their mom has pointed this out at some time or another on this board, you will see plenty of pictures of people wearing sakura kimono to hanami or fireworks yukata to hanabi and the like. For one, those may be the only kimono / yukata they own. And for two, well, like I said, it's sort of an obvious thing to do, so you're going to see people doing it. 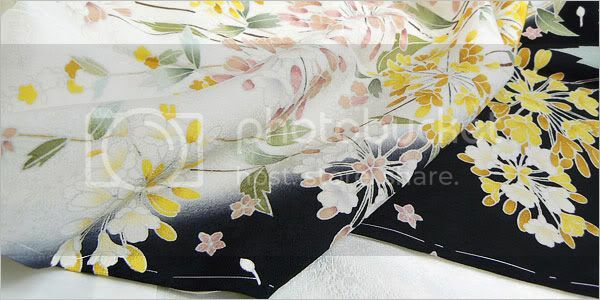 It's really up to you if you want to wear a sakura kimono to hanami. From the aforementioned book. My translating would've been a nightmare, so someone else pleases? *cry* I still can't figure out some of these flowers...can someone help me out a bit? And then these, which have me so confused I don't know which was is up. And are these big things peonies? 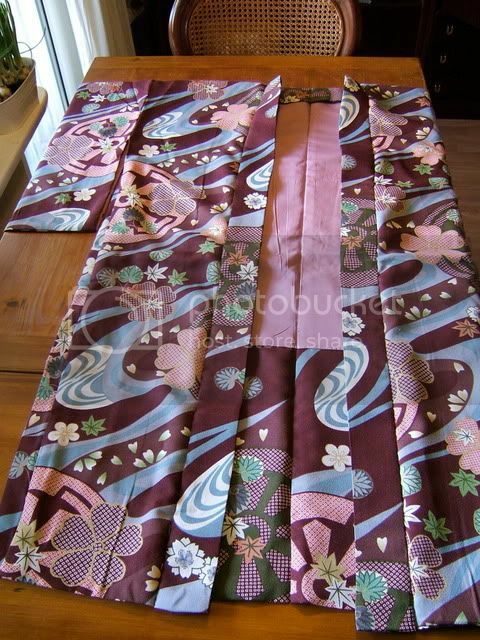 If it helps, the kimono is lined (in bright salmon-pink no less). 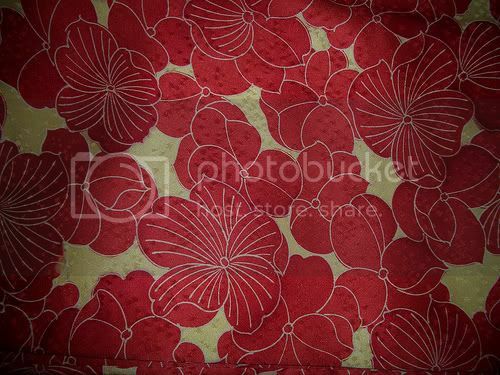 "Choosing patterns of kimono according to the seasons is fun. 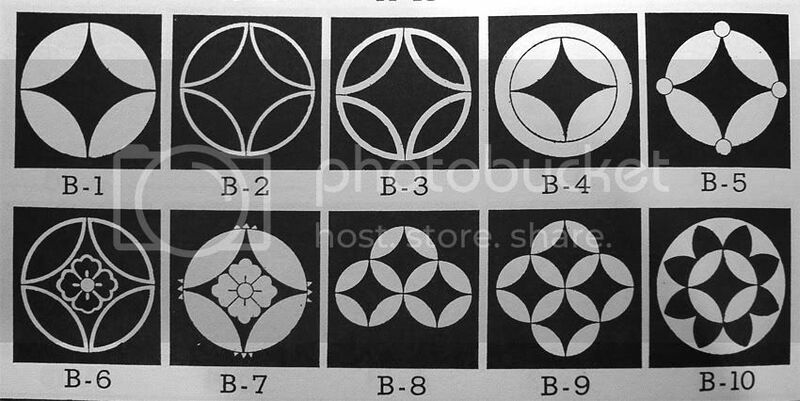 Patterns such as sakura and ume should be used only a bit before their actual seasons. 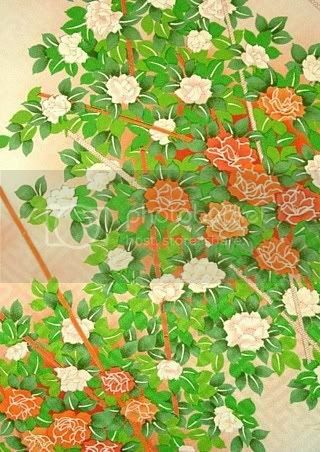 During Edo period, just before the sakura season, women would wear sakura patterns on their kimono in the streets and the feeling of spring spread throughout the town. It must have been a lovely view. 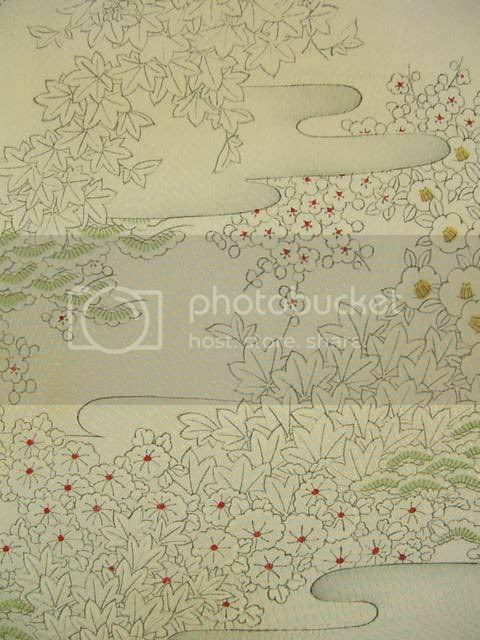 There were also many ways of depicting sakura flowers on kitsuke. There are people that like deep pink layered sakura and people who like simple white sakura. 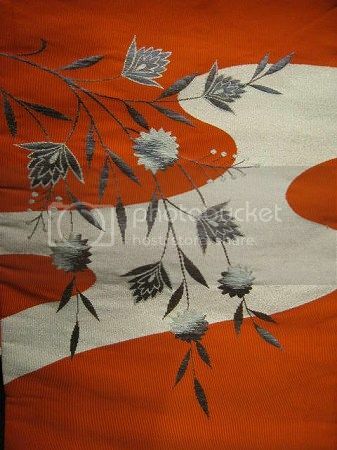 There are also other places to display sakura patterns in kitsuke, such as obi; the colour of sakura may also suggest the flower in items such as komono. 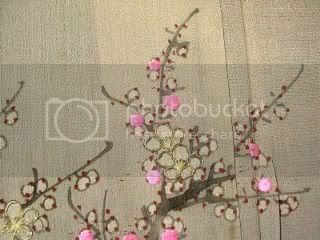 In jubans made for use underneath kuro-furisode, the han-eri might be filled with brilliant embroidery showing sakura in full bloom. If you have kitsuke friends, you could decide themes for your meetings to double the fun." Do obi follow the same season rules as kimono?? 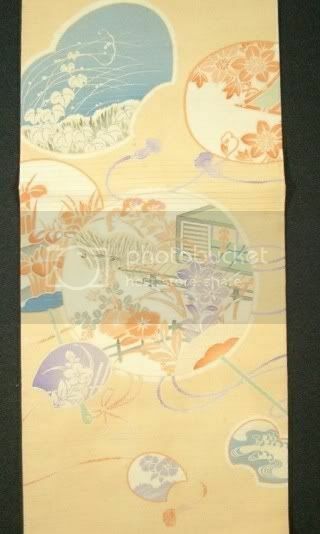 Murakami wrote: Do obi follow the same season rules as kimono?? Oh yes. Primroses are spring no matter what they are on, kanzashi, kimono or obi. 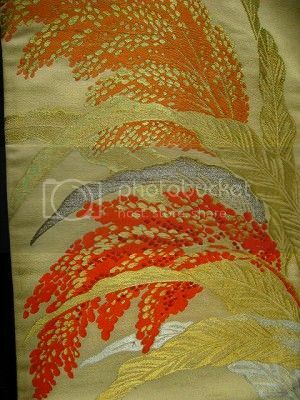 But I do think it's thought to be geiko-iki to wear obi with patterns that are a bit more pre-season than those on the kimono. 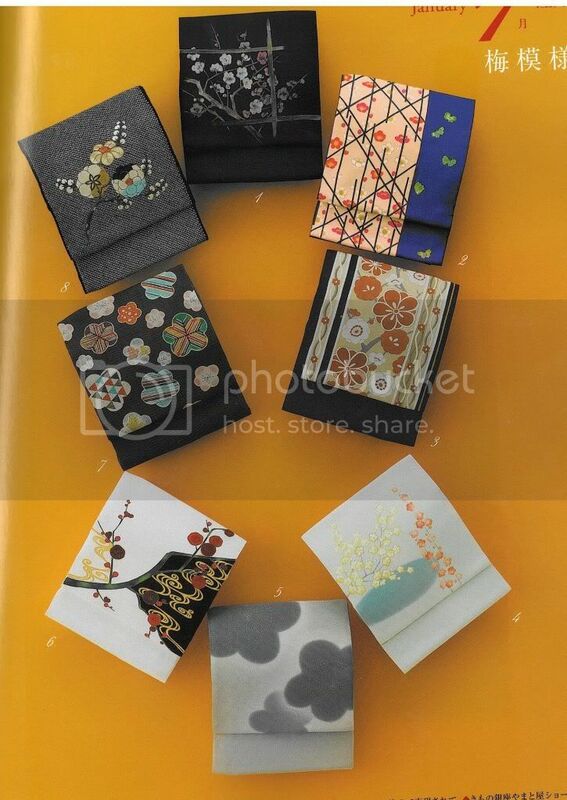 I got myself a kimono magazine recently. 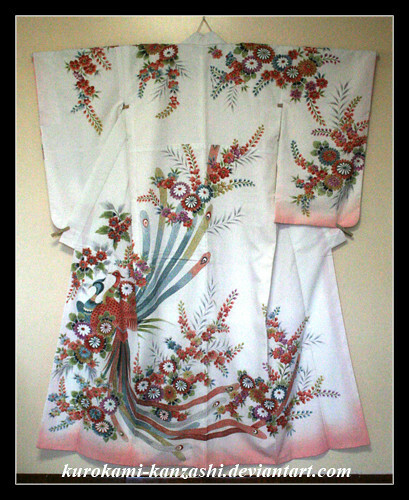 I didn't really know what to expect, and got it sort of on a whim but what I got was a real kimono 'vogue'! The magazine is from Winter 2008. December 12 - not sure if it's for Dec 12 exclusively, or just a suggestion for December in general, or for Dec 12-31. January 1 - again, same thing as above. February 2 - is there something special going on in Japan on Feb 2? So I have ume.... bamboo... and what is in the background? And does that make this spring? Even with the bamboo?? These are other sections of the bolt.. in honesty I was hoping would be obi material. With daffodils and cysanthimums (kiku)?? Other than that, yes, kiku, ume, and suisen (daffodils.) It is multi-seasonal indeed. Butterflies are usually associated with spring, carps with summer, dragonflies, fireflies, and cicada with late summer, bunnies and deers with autumn... Chidori are both a summer motif (Water! Coolness!) and a winter auspicious one. Here's a link to seasonal themes in traditional poetry. I think that apart from kikyo, nearly all your flowers fit into the awase part of the year. Now that I think of it, I don't see any late spring flowers either: sakura, fuji, tachibana, botan, etc... but they might figure on other parts of the bolt. Because of that, it might be difficult to wear it in the spring-hitoe season, especially with its autumnal colours. You could also half-line it to keep it cool while looking proper, I guess. 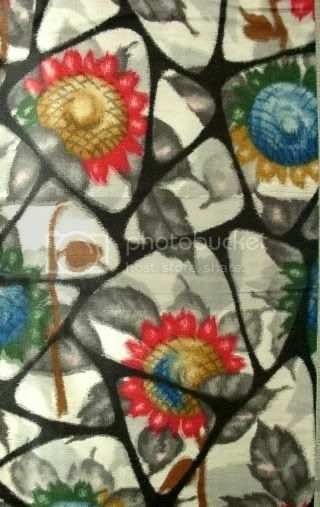 this is described as flower lozenge pattern. 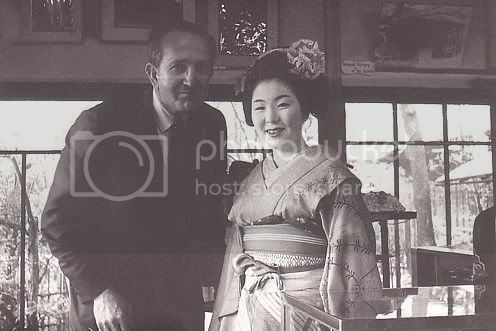 and this one with the kiri... aren't kiri a symbol of the royal family? Tahanala.. maybe you could just tutor me. I feel quiet the novice. and the kiri.. would work with both.... the one to be made.. and the other. BTW... would bending grass be fall?? Thank you so much for your answers... and help. I think I remember that grasses covered with dew-drops (tsuyushiba) are representative of summer, bt I'm not sure about plain blades. I'd say autumn, as part of the 7 herbs of autumn (no, not the "7 words") but I could be wrong. I'm stumped by these last flowers. The petals look like sakura, but the leaves certainly don't. It might be nadeshiko (pinks) with fringed petals, in which case I've seen them from June to September. If I were you, I would check the "Bad service" thread in the Marketplace forum, several persons -including myself- have never received their package from this seller. I had ordered from them several times without any problem in the past, but they proved most unhelpful when I emailed them about the loss this time. It could very well be a coincidence and a one-time accident, but I'd be careful if I were you to use a tractable shipping option with insurance. Their beige items have also turned out to be distinctly green several times, so do double-check the colour with them before bidding! I was thinking cranes.. as they have a lil beaky hook, off the head. so that leaves it as pines... but pines and dianthus?? *looks* BTW... have the two of us TOTALLY hi-jacked this thread?? Not quite, we're wondering about motifs, after all. Would there be another thread about "What the heck is this pattern?" The birds could be pheasants, too, cranes don't have that long tail. Peacocks obviously do, but I've never seen them represented in flight, without any tail-eye display. If they are birds, they the plant is probably matsu, considering the scale. 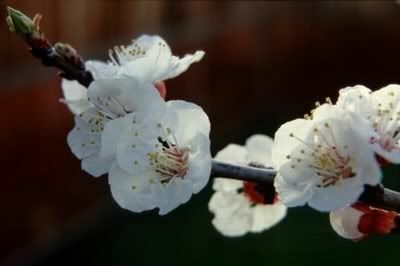 I agree the spots and sticks look like ume. The fabric seems quite thick, too. These have been bothering me a while. 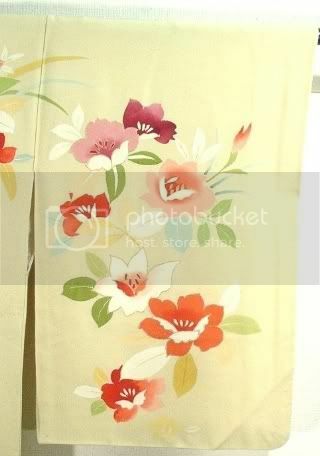 I would be very happy if someone could tell me what flowers/plants are in these kimono/obi and their seasonality. 1. Could that flower be azalea? 2. Is that orange flower same as the previous one? 7. Are they just leaves or some specific plant? And the birds just non-specific birds? Muhvi, Maybe #3 is tachiaoi. #4 is a grape vine. 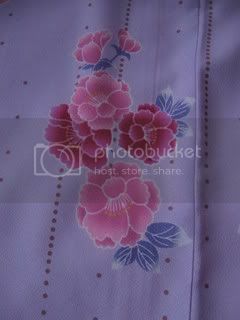 While I'm at it, another question: I've got a kimono (I think tsukesage, but am still arguing with myself) with sakura on it but it's unlined. Now no matter how I twist it, I can't fit sakura into hitoe. Am I supposed to line it myself? It's not karinui! I don't think the lack of lining is noticeable, though, the cloth is quite a tight weave. 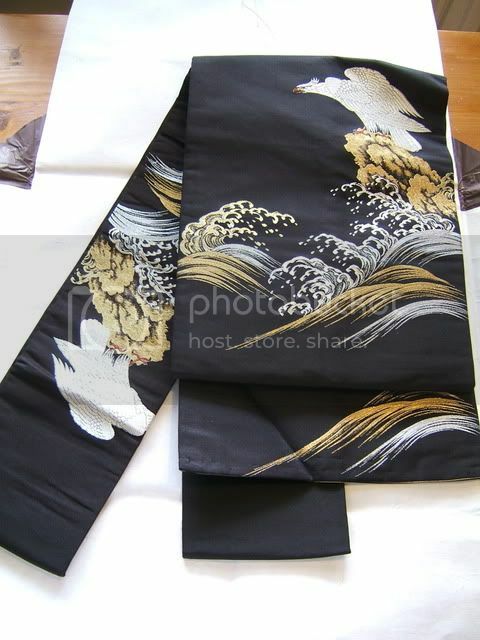 A question that has bugged me for a while- what is the point of summer motives (= hitoe season) on awase kimono? Is there something that tomesode are always lined? I know the question has been asked before, but somehow there hasn't been an answer that I can find. Dagorwen: hitoe tomesode do exist. I've always thought that awase kimonos with hitoe season patterns are meant for exceptionally cool summers or mountainous areas 9v9 Or then they are cleverly multi-season. Your sakura hitoe might be completely wearable in Japan at hanami time. I visited a year ago and by the time of plum, it was quite warm enough for hitoe (well at least for me). And then again, seasonality is not simply a question of which flowers blooms when. There are yukata with snowflakes to evoke a relieving coll feel in a viewer, and the wearer as well, even though summer snow is quite rare. 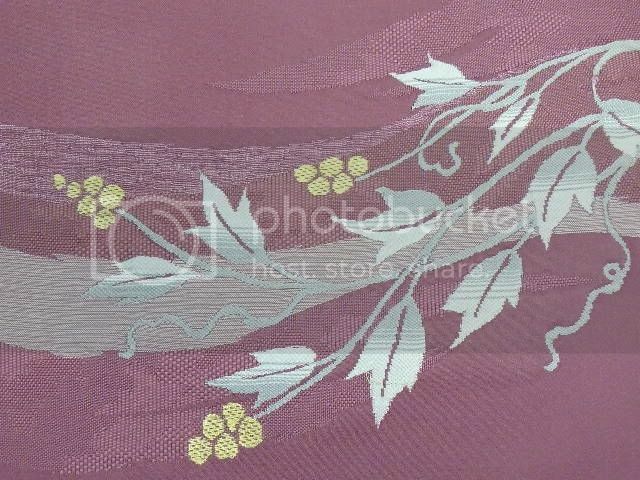 I could imagine a sakura awase worn in winter, with matching haori/michiyuki/something to "protect" the fragile flowers from the cold. 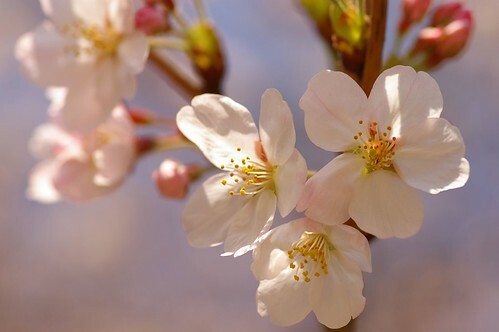 Or a sakura awase as dônuki, flashing occasionally a tiny bit of flowers beneath a subdued winter pattern in anticipation of spring! Roses might be even spring season if we want to consider them as "the official Valetine's" flower in our own cultural contexts so there. Heavens know I'd dress in blue, white and lions for November 6th if I had a wardrobe to match. 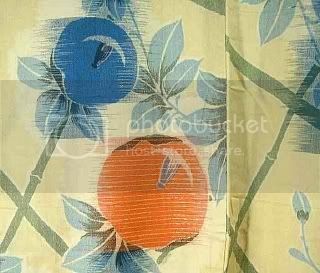 It's not all about Japan, and the more we want to call us wearers of kimono as opposed to mannequins of kimono, the more we should be aware of our home culture and seasonality as well. IMHO. There also is the matter of the kind of "roses" we're talking about here. 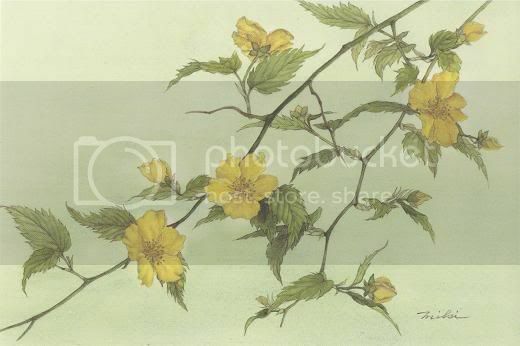 What is often called "Japanese wild rose" is yamabuki, kerria, and is totally different from real roses. It does indeed bloom around April, and its blossoms are yellow. It is even sometimes called Easter Rose. I think Muhvi's image n°5 might represent it; on the other hand, n°4's leaves are very different from real grapevine ones, and the fruit aren't alike either. 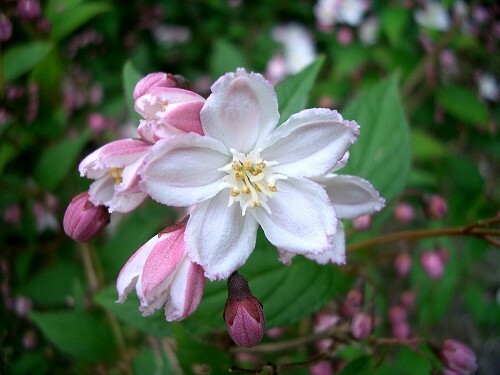 N° 1 and 2 do seem similar, maybe they are u no hana AKA deutzia? If so, they are late spring or early summer. I have a ro obi featuring some. loreamar - Thanks for info! 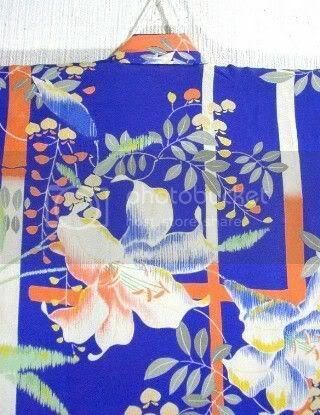 The kimono is lined and quite heavy, what might be appropriate season for it? Spring or autumn maybe? Tanahala - Thank you! Finally I know when I can wear my tsukesage! Here is another strange plant. If I would have to guess, I would say it is rice, but on the other hand the leaves look bit too wide and frilly for rice. 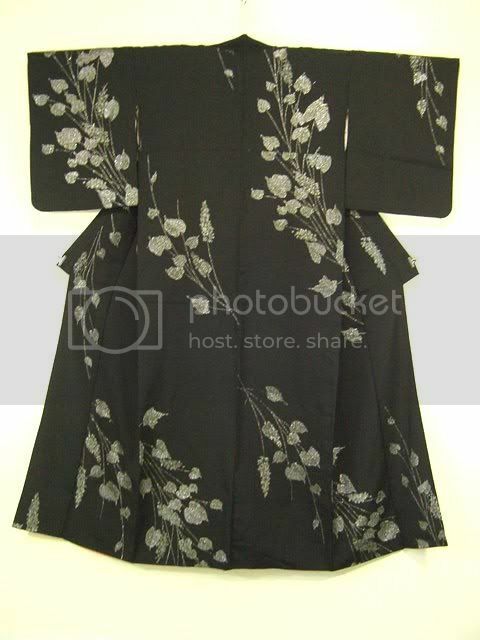 This n°3 dark kimono cannot be tachiaoi, the flowers/seeds are way different. I have an impression they might be seeds, not flowers, so it would be autumn. Even without positively identifying it, I feel there is a plethora of spring flowers we all know that would be preferentially depicted. Your obi looks suspiciously like millet to me, too. I considered amaranth, but their flowers fall down, and the leaves are way too long. Common Millet fits perfectly, though. Peccantis, Tahanala: Thanks for your help! 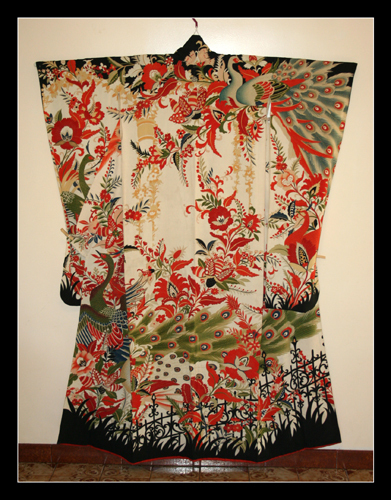 I like the concept of translating and enlivening the kimono in our own contexts. Still, before I adapt too much and perhaps sloppily I like to understand the orthodox views. Peccantis, the idea of protected petals is a real nice one! It reminds me of how buds sometimes can be protected from sudden frost by encasing them in water drops that freeze. It is a beautiful sight! I'm wondering for a while now if there's a special meaning to the composition of momiji and ume :? 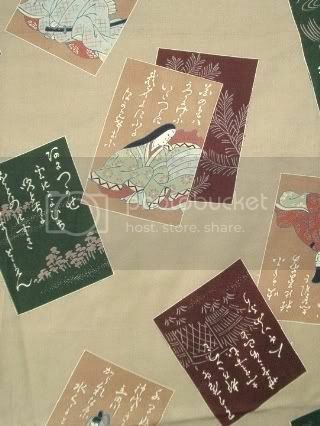 I haven't only seen kimono with this pattern, but also on scrolls/paintings, pottery and others. 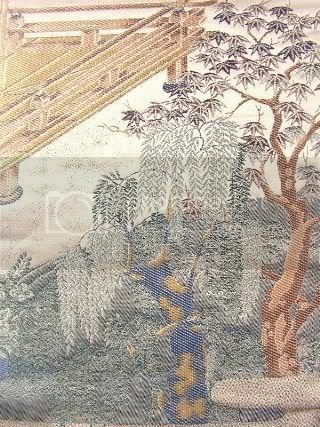 So, I guess there might be a special meaning such as there's a certain meaning to pine, bamboo and ume: sho-chiku-bai. 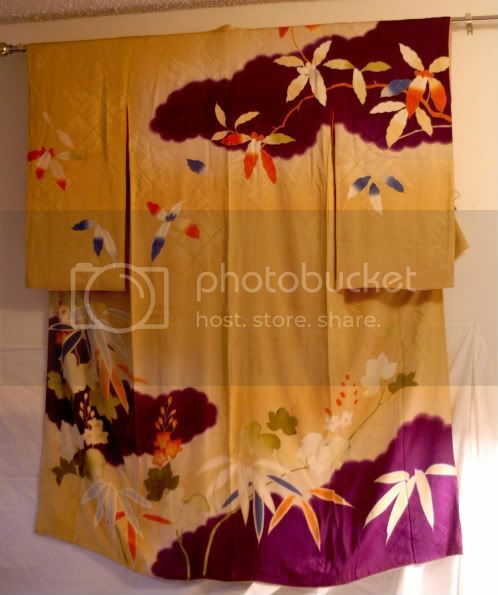 When do you wear such kimono? 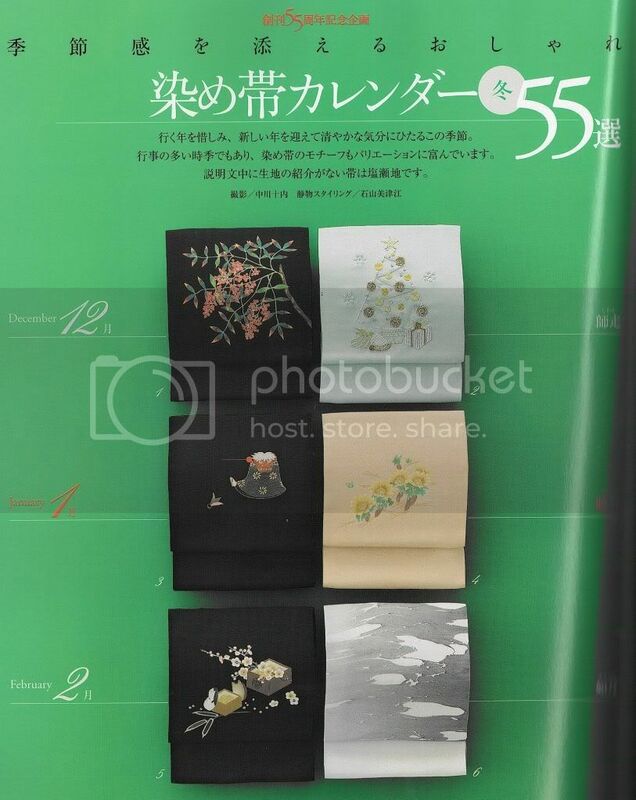 Sho-chiku-bai is worn in January because it's a New Year pattern, although ume is a February pattern. 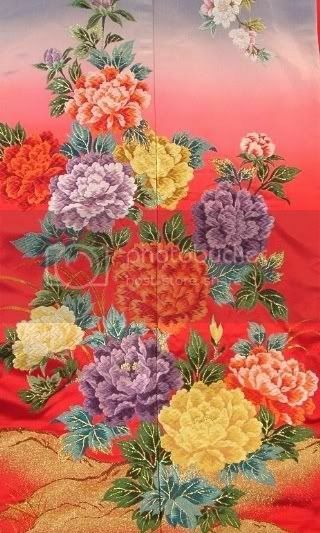 I even remember there were kimono on ebay with this pattern which were hitoe, so not really appropriate for winter/early spring. 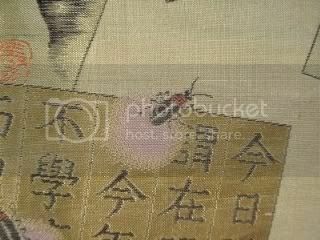 onnagata: maybe it's a sophisticated "everything is fleeting except the seasons" note? You can wear a momiji-ume hitoe in autumn to say "sure, cold danky winter is coming, but so is the fragrant spring" and in the spring to say "smell the ume before the bloom is gone; autumn will be here sooner than you think". 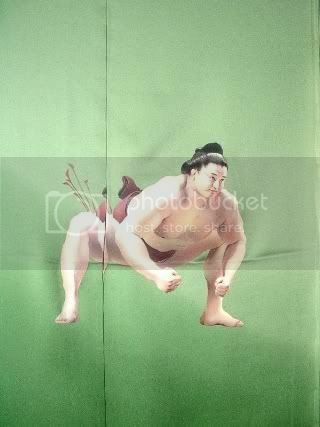 My 2 yen. Momiji can also be a spring motif, when it is sprouting. It is more likely to be in green shade then, and its position to be different from falling leaves. 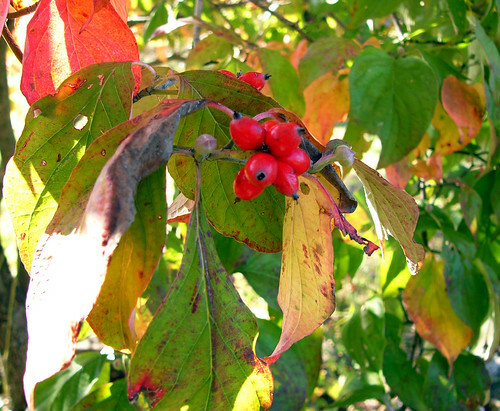 However, autumn-to-beginning-of-spring is often the most likely option. 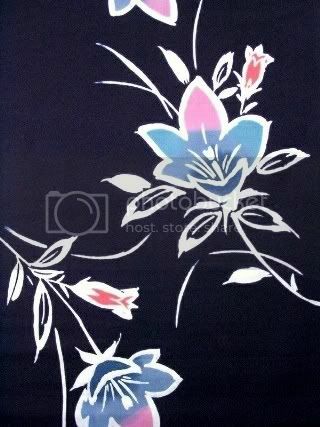 The you have the whole range of spring blossoms and flowers to choose from! I've read somewhere on this forum that there is seasonality to different water patterns f. ex. flowing water, etc. I believe it is mostly winter. Is this the topic you were referring to? Yes, that's it. Thank you! 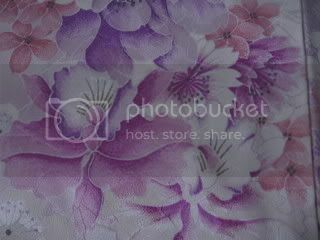 moonblossom wrote: Thanks for the info! I'll just have to take it out and ogle it the rest of the year, or wear it where I know there's no chance whatsoever of running into someone who would know better. 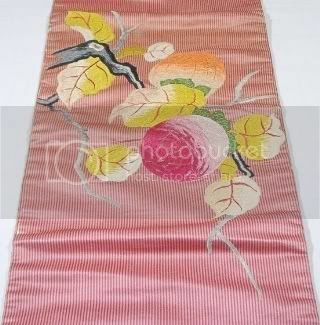 I was re-reading this thread, and thought, how sad to merely ogle your beloved kimono for most of the year. or in January as an auspicious motif for good tidings for the New Year. Or, if you are not doing anything formal, what the heck, wear it whenever you want! 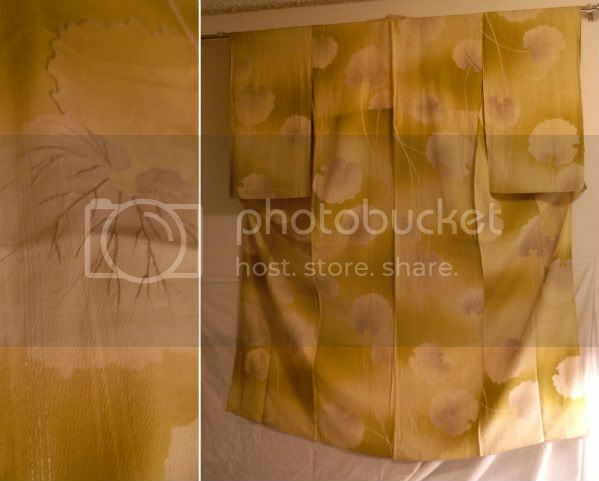 I'm stumped on these two kimono, can anyone help me out? A Taisho houmongi. I can identify the bamboo and bellflower on the bottom, but I don't know what those branches on top are. 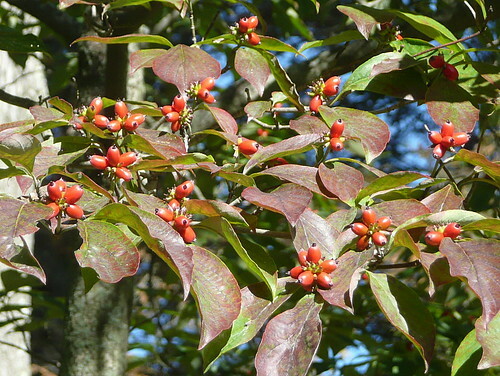 Is the 2nd one maybe flowering dogwood? 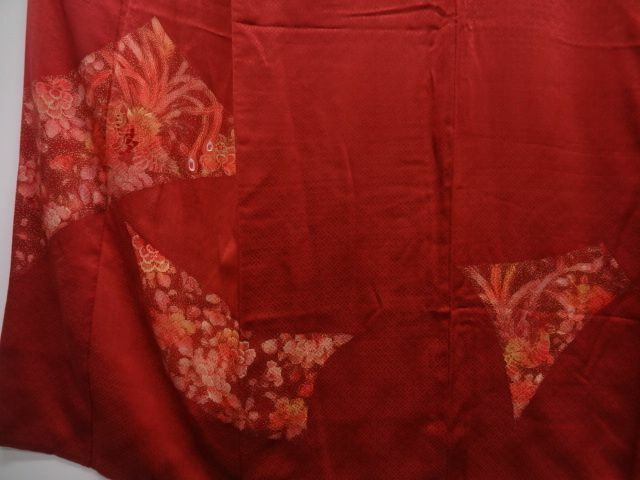 We have some here on campus that look a lot like the motif on your kimono, but I can't find a good picture to do the shape of the leaves justice. 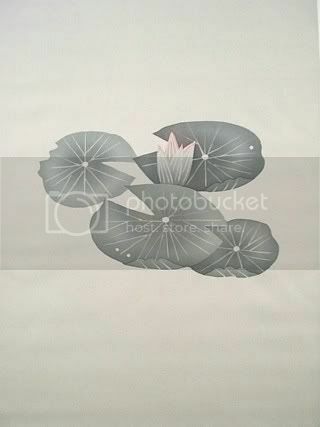 Tahanala, I think you're right about it being lotus leaves. 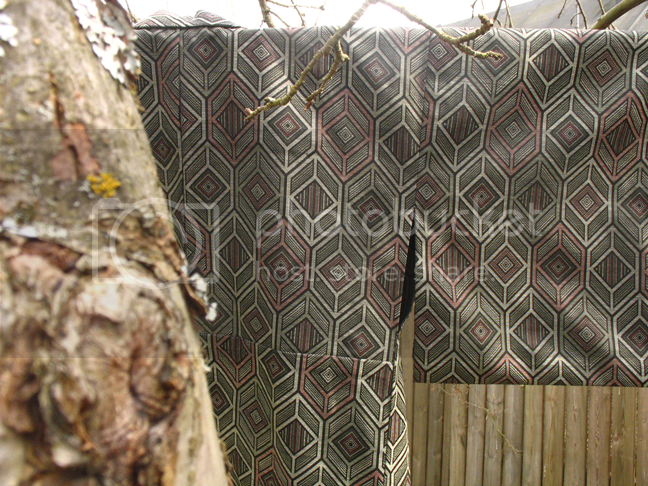 That would also match seasonally, since the komon is hitoe. 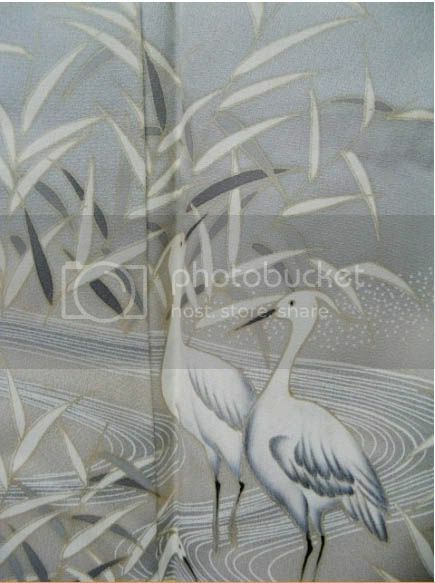 Anyone know if herons are season-specific motif, and if so, what season? 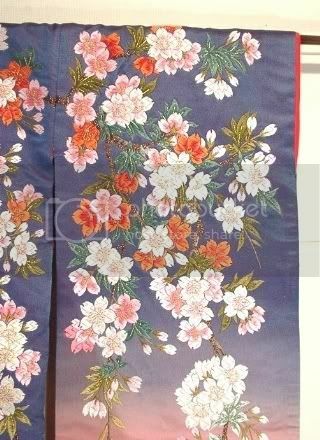 My guess for this kimono would be autumn, but am I wrong? Tahanala I havent found a clear answer about the seasonality of aoi but there is the Aoi Matsuri in May in Kyoto. 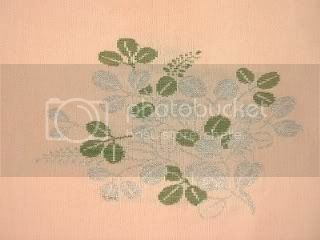 They use hollyhock leaves for decoration. I don't know the answer to either aoi or herons, but you might try Googling on kigo list (or kigo saijiki) to see if there are any lists of kigo (seasonal words) that include these terms. 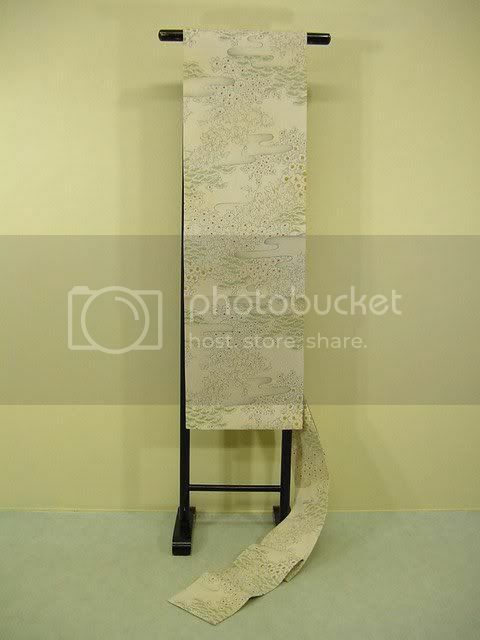 Kigo lists are generally prepared for use in poetry, but they're valid for more general purposes, such as seasonality of design elements in kimono, tea utensils, etc. For example, there's The Five Hundred Essential Japanese Seasonal Words. The same list includes hollyhock under summer, which fits with Kokoro's comment about Aoi Matsuri since May is the beginning of summer in the Japanese calendar. 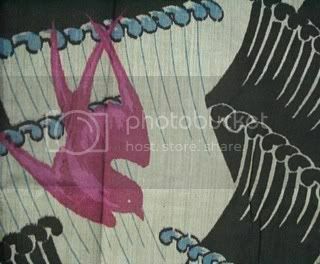 chamekke - Thanks for the info, but I think my heron kimono is not very appropriate for summer since it is lined. I am guessing maybe autumn, there seem to be reeds among the birds and they are quite autumnal, right :ermum ? Hmmm muhvi, your kimono looks quite wintery for me. Kareashi (withered reeds) are a winter motive and as we know from other birds like chidori you use summer motives in winter to create a "warm" feeling. Kokoro - Yes yes yes thankyou!! Not another autumn kimono :katana: ! I love winter! For now I make it officially winter kimono! Shame I have to wait a year to wear it in correct season :P .
What kind of flowers are those? And is there a month they do apply to or is it for summer in general? It's mostly an assortment of ''karabana'', i.e. fantasy flowers, which don't have a season. There are a few parts with auspicious open and folded ''sensu'' (fan) (yellow area at lower left), and a two-part ying/yang type pattern that is sometimes seen as three-part and whose name I cannot recall. At far left, on yellow, is an auspicious "coin" pattern of interlocking circles (cannot remember name). 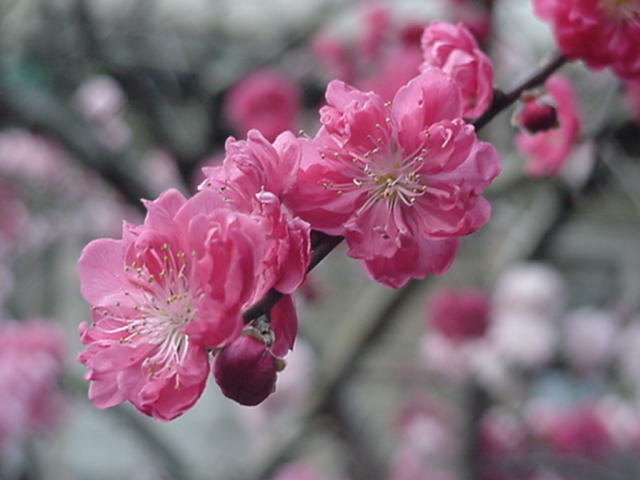 There are some flowers that resemble ''ume'', ''kiku'', and ''sakura'', but combined with those imaginary leaves I'd say they aren't meant to denote seasonality. I just spotted an unpatterned kiribame komon on eBay. It was really dark blue/green + white. From having a good number of mature cones in our summer home's yard, I happen to know pines love to open and drop their ripened cones in middle and later July when it gets dryer and hotter. 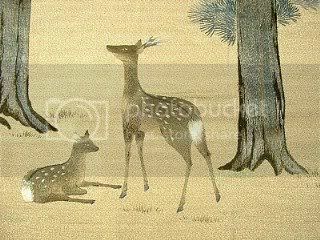 The obi however is awase, and I'm thinking pine cones as a winter motif isn't a far fetched idea. What say you guys? Does anyone have the know? I know matsuba are winter, so my uninformed guess would be that cone go along. Personally, I associate pine cones with winter and Christmas. Yes, pine needles are winter, but you shouldn't assume After all, water motifs span the whole season cycle: mist for spring, dewdrops, waterfalls and icebergs for summer, clear springs and ripples for autumn, crushing waves and snow for winter. Continuing from Welcome to Kimono Anonymous. Peccantis wrote: It's the first time I see pine cones on obi. Aren't they precious? 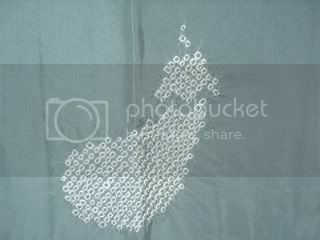 Those small-pattern Nagoya are always interesting to me, as the design looks like the old fashioned maru obi. Do you think they're formal? What do you plan to wear it with? 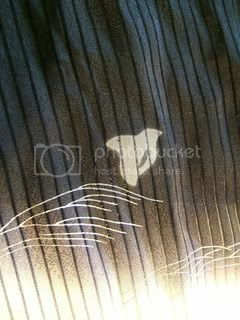 I have an obi which allegedly has a pine cone design, but it's so stylised, it's basically a shibori splodge. I think the seller (Ryu?) was a bit over-interpretative! Do you have images at hand, I'd like to see! It's fully orimono, so I was supposing it was a little fancy but not formal... 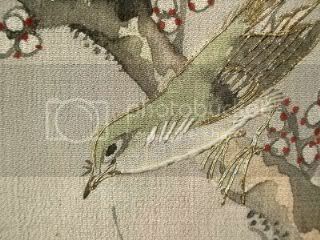 But now that I look at the picture more closely (it's a thumbnail), there are ever so slightt golden threads woven in. So... Strictly speaking... :? I am reminded of "granny formal" with suitably subtle metalwork and *ahem* mature motifs with subdued colours. edit//forgot to add this thought, but this topic about hitoe komon with nothing but matsuba (!) reminded me - is matsuba that strictly a winter motif after all :? Question... What season are peacocks? Or are they seasonless? 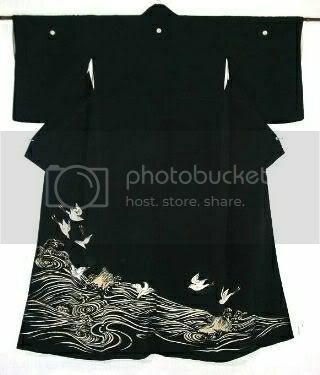 And now, this has got me wondering... What season would I classify this furisode? 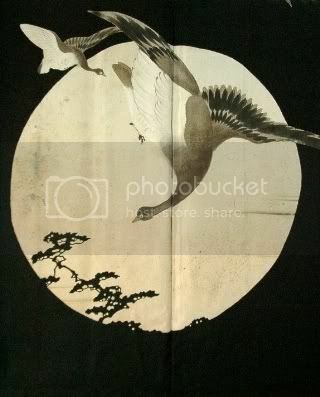 Aside from the peacocks, I can't see any definitely Japanese motifs. I think the peacocks are the only thing that would end up defining the seasonality. 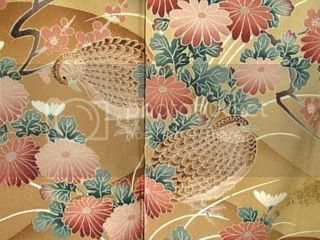 I think the peacock is a borrowed, non-native animal and most books say it came to Japan by way of China. If my semi-feral neighborhood peacock is any indication, peacocks keep at least some of their tail plumage all-year round. 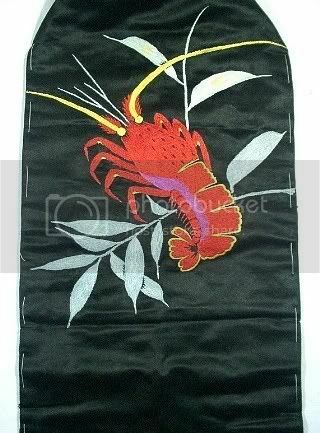 Most items I've seen are lined and I honestly don't see many summer items with peacock motifs. 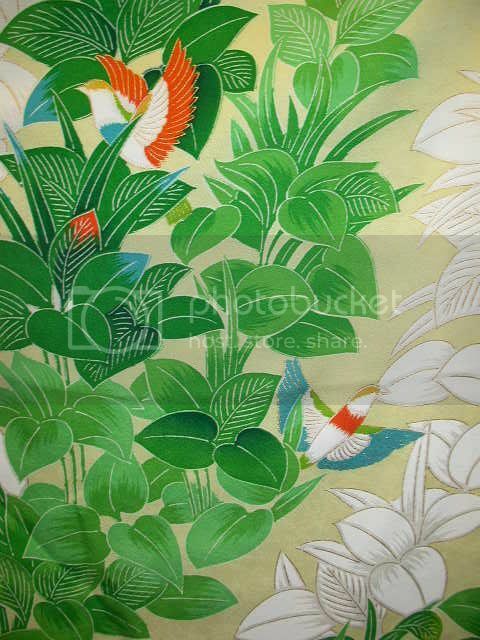 (If you find a peacock-themed yukata I'm betting it's modern - and I want one.) Go with your gut if you think it's autumnal. 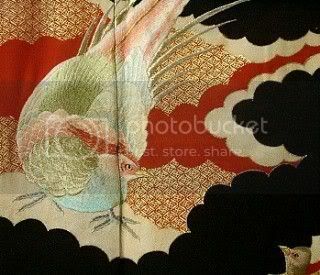 Japanese Hou-oo comes from the Chinese Fenghuang, a chimera of many birds including pheasant, duck, peacock, crane, etc. It's considered the Emperor of all Birds and doesn't really bear any resemblance to the Egyptian phoenix myth at all, but are rather considered auspicious and all-seasonal. 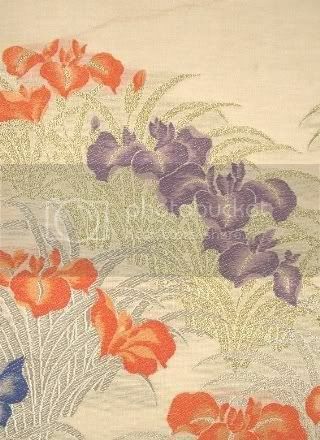 Where the Chinese would depict them with paulownia and bamboo, the Japanese used grasses and flowers. 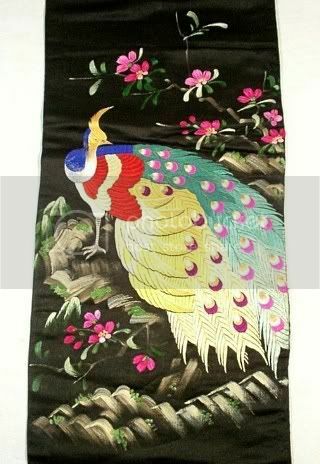 You could wear peacocks to a wedding because it resembles something auspicious, sure. so you would say pheonix is non seasonal ? I would like to know , cause I got this red tsukesage with some pheonix on it. The colors are very bold but shiny and the pheonix has some golden ebroidery. 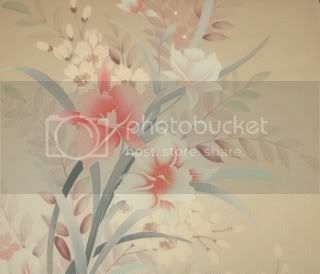 The flower look like peony to me, which would be spring. 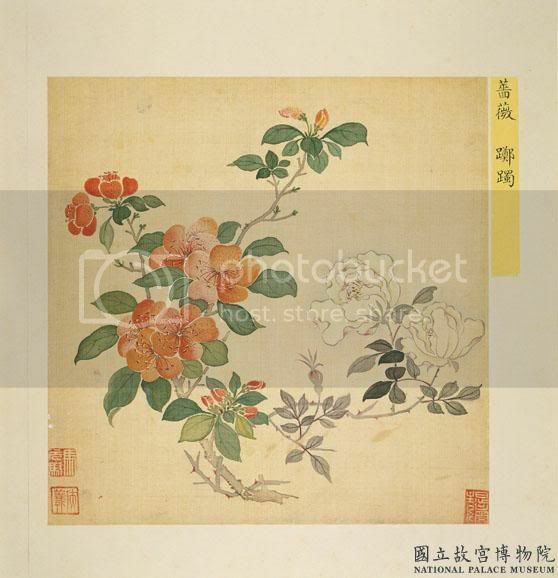 "Auspicious Motifs (Kisshou Monyou): ... These motifs are not seasonal and can be worn year-round." The Phoenix is included in this list. 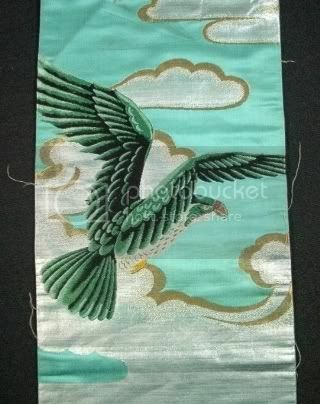 :) The Phoenix design "gracefully increases the auspiciousness (of an outfit)." I thought phoenix was a spring motive. bebemochi wrote: There are a bunch of motifs that, for some reason, are present on both summer and winter items. Crashing waves, chidori, and fishing bets seem like purely summery things, but you see them on winter things all the time. Ditto snowflakes in various incarnations; you see them on summer things all the time. I think it's about invoking whatever temperature you aren't feeling at the time. Summery, beachy things make you feel warmer in the winter, while snowy, wintery things make you feel cooler in the summer. 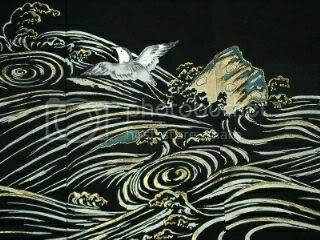 The nami-chidori (wave and plovers) motif can be used for both summer and winter. Based on my extremely limited experience, I think that when the chidori are charmingly stylized (think Pontocho) and when the waves/ripples are gentle, it's likelier to signify summer. 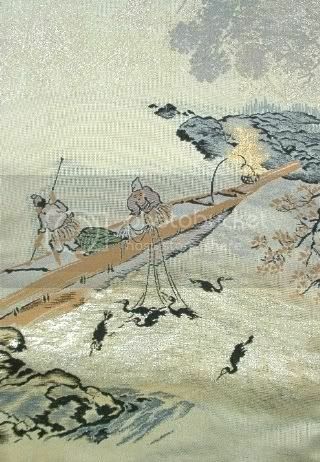 (You may also see other motifs, such as jakago and fishing nets.) When the chidori and waves are more naturally depicted, and perhaps also when the waves are crashing or "violent", it's likelier to signify winter. Incidentally, I found a textual reference for chidori in wintertime. In Sasaki Sanmi's Chado : the Way of Tea : A Japanese Tea Master's Almanac, Sanmi locates chidori as one of December's kigo or seasonal words. He specifically mentions its "mournful" voice. I remember reading elsewhere (but can't recall where!) 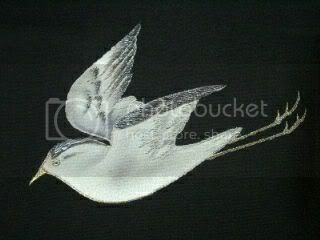 that cites the desolate sound of plovers' voices on a deserted beach in winter. For sure, the images on the kurotomesode above SCREAM winter to me - there's nothing remotely summerlike about them. 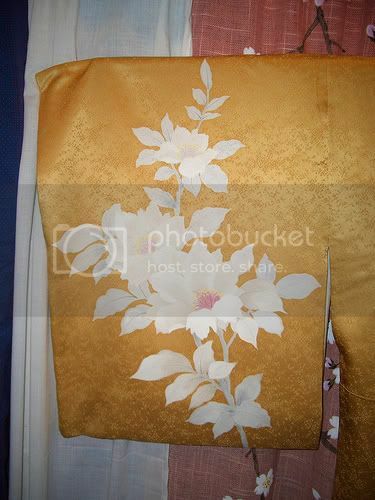 I've also got a nami-chidori kimono, my five-crested irotomesode. It's got big violent crashing waves, but Ponto-cho style chidori. It's heavy and fully lined. I did know that taka is a winter motive but I wasn´t sure about the waves. I'm honestly not sure how much one can generalize about the waves (I was making a generalization and hoping to be contradicted!). But, it does seem that "cute", Pontocho-style chidori = summer items, while more "realistic" (naturalistic) chidori are likelier to appear on winter items. Of course colour may play a part in distinguishing one from the other, too. 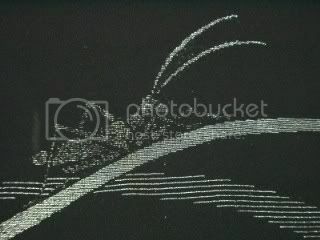 This motif as I undestand is water, what Season is it? 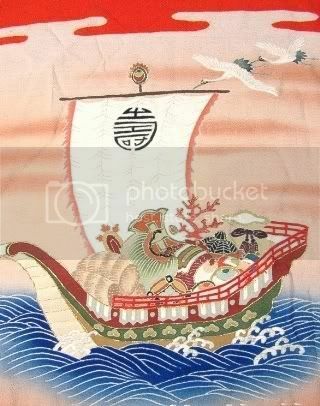 I believe those are whirlpools (Japanese: uzumaki) and they are a summer motif. Someone should double-check me though. 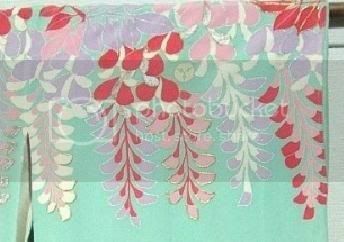 The fabric seems to be ro, too, so you're pretty certain it is appropriate for sumer.